I am a Statistician…an Artist. I am passionate about learning new things and wrestling with ideas. Statistics provides a platform to learn about any science, business, industry, etc. I am NOT a data grinder or a computer software add-on. I am a collaborator, a consultant and a teacher on a mission to discover! To discover truths, trends or insights that can help us see things in new ways. 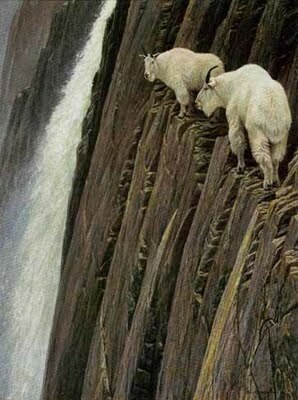 I may talk from time to time about mountain goats. If you have ever been fortunate enough to witness these majestic creatures in the wild you will undoubtedly understand the nearly universal reaction: “How in the world did they get THERE!? !” This is my mantra, seeking out the next impossible place to climb, helping people sort through MOUNTAINS of data that seem impossible to scale.